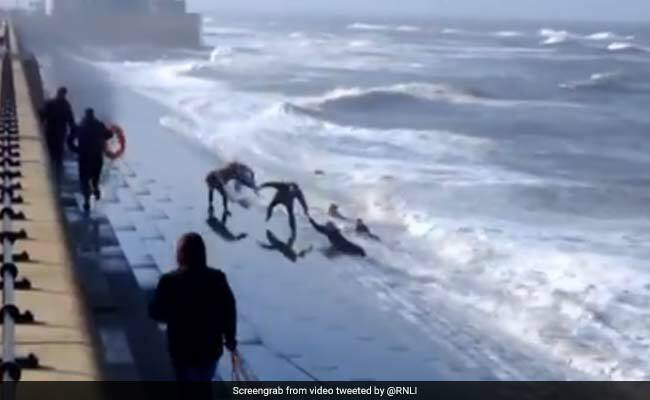 In shocking mobile footage from Yorkshire, United Kingdom, a man had to be rescued as violent waves swept him off a sea-side promenade. But onlookers who stepped in to save the man also found themselves in need of help as they faced trouble getting out of the rough waters. The video opens with a few men trying to help a man out of the water. But the rescue effort is repeatedly hampered by waves that keep hitting the men and throwing them back into the water. The men are no match to the waves as they barely manage to stand up while trying to make their way up the promenade steps. As a crowd gathers to witness the disturbing situation, help arrives in the form of coast guard personnel who rush to the promenade carrying rescue tubes. More passersby join the coast guard workers to rescue the two drowning men but it takes more than one attempt to reel in the third man. As waves crash against the stairs, he loses grip of the flotation tube several times. After a tense few seconds, that may have felt much longer, the man is successfully pulled out of the water. The footage was uploaded by UK's Royal National Lifeboat Institution on Twitter as a warning to others. "A man recently fell from the promenade at Redcar into the water. Passers-by naturally rushed to help. However, they too found themselves in difficulty. All escaped with their lives. If you see someone else in trouble in the water, call 999 or 112 and ask for the Coastguard," they tweeted.